A flamer, or a flamethrower, is a short-ranged weapon that deals fire damage over an area. It is the only type of weapon capable of fire damage without the fire coating add-on. An enemy hit with the flamer would burn for a while, taking damage over time. The fire damage from a flamer lasts for 3 seconds. If a target is hit multiple times by the flamer the duration is refreshed every time the target is hit. Durations do not stack, so any duration left when refreshing the fire damage is lost. The movement speed during its use is relatively low among all classes of weapons (the pistols have a flexibility advantage of 500% over the flamers). The flamer is suitable for close-ranged battles against groups of mutants, especially wasps and gloom bringer minions. Some players would use the flamer in combination with poison add-ons to slow down the mutants that come too close to them, effectively creating a fire barrier between them. Running and gunning with the flamer is a viable option. 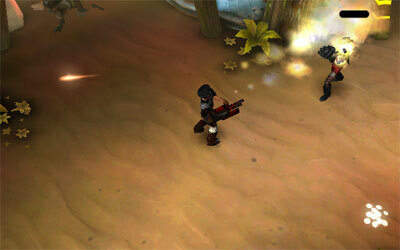 Since the fire attack takes time, doing so would allow you to maximize the effect of fire, while remaining mobile. It does reduce your move speed by 10% using heavy weapons like the Behemoth, but that effect would not take place when you switch to the Nine-Inch in-game (it will return to 118%, although not shown in character screen). That is to say, the combo would cause a change in the figures in the character screen, but if you know when to use which weapon (Behemoth for earlier waves, Nine-Inch for later waves), it doesn't really affect too much, since no matter which combo you use, the speed during the use of Nine-Inch stays the same (at 118%). One last thing. I have tried the combo Nine-Inches/Behemoth that you use but in my case it decreases 10% my move speed. It scores 108%. With the same add-ons the combo Nine-Inches with a lower flammer (Apocalypse) or RPG (Anihilator) it scores 118%. I see a big difference when running at the head of the heard or ... is it just a false impression? Rgds. Thks for the input. I will try that way. Sometimes you don't really have to take out the dark shamans first since you will be able to damage the mutants faster than they can heal, provided that you run fast enough and the dark shamans are left behind. Running too close to the mutants at wave 19 would cause the contaminators to throw a lot of kamikaze-caterpillars, that's when people start losing the game. Thanks for the info. I checked out the video and confirmed that in the last waves only the Nine-Inches prevail. I saw also the extensive use of speed bosts which result in 90% of the time just firing to the end of the screen without watching who is taking the shot. Maybe this is the clue to finish the 20 waves. I use to ran in front of the herd of mutants a little bit closer to see where are the shamies and figure out how can I send them back with their ancestors. The price is that I never finished wave 20, so I will use speed bosts now. Thks. The Behemoth is used to damage groups of low health mutants. It comes with a splash damage and is good for taking out those that come together. The Nine-Inch is better against single target high health mutants like the contaminators and the crocodylians. It requires higher precision, but less shots to take out one mutant. Did you check out the video on the homepage entitled "The Run"? You can see how to use the Behemoth and Nine-Inch in action. In chapter 3 hell mode, it is easier to hit the spiders (gloom bringer minions) so you can use the crossbow or RPG against them, while the Phoenix may not do much help in this case since they have higher health. You are totally right. Talking about later waves, I could never complete the 20. My connection fails when the traffic of data increases a lot because of the number of mutants on screen. Yesterday I was disconnected at the end of wave 19 in a game and in the middle of wave 20 in other. At least I got a good crop of crystals to keep buying fine pieces of artillery. You should run around the map to kill most of the mutants before reviving a teammate, especially in later waves of the game. But that teammate has to be patient enough to wait. Many new players just don't have that patience and quit as soon as they think you are not going to revive them.